The Pelpro Corn Stove is derived from the Pelpro Home Heater 120, it is large, square and designed for functionality together with low price. With its generous hopper size, a burn time of up to sixty hours is possible. 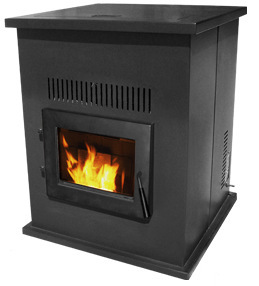 This stove is rated to heat an area of 2,000 square feet and can generate 50,000 btu. per hour. There is no ash pan. See comments below. Corn ignites at a high temperature, and with this stove there is no automatic ignition system. A handful of wood pellets mixed with starter gel must be placed in the grate and the fire started by hand. Because of this, thermostatic on/off mode is not possible. Min. Heat Output 15,000 btu. Convection Blower Capacity 265 cfm. Window Size 11 in. by 8 in. Rear Vent Height 8.75 in. The air damper must be adjusted manually to suit the burn rate. The Pelpro Corn Stove has no ash pan or drawer, ashes must be scooped out. Optional thermostat can only be run in high/low mode, see introduction. Check the door gasket, clean the air intake, combustion and convection fans, check the hopper for a build up of fines, clean out the stove ash traps. Inspect and clean the flue vent, vacuum the hopper.